Consider the true cost of a product over its entire life—from harvesting the raw materials to creating, consuming, and disposing of it—and the scale tips dramatically in recycling’s favor. Every shrink-wrapped toy or tool or medical device we buy bears the stamp of its energy-intensive history: mountains of ore that have been mined (bauxite, say, for aluminum cans), coal plants and oil refineries, railcars, assembly lines. A product’s true cost includes greenhouse gases emitted in its creation as well as use, and pollutants that cause acid rain, smog, and fouled waterways. Recycling—substituting scrap for virgin materials—not only conserves natural esources and reduces the amount of waste that must be burned or buried, it also reduces pollution and the demand for energy. “You get tremendous Btu savings,” Hale says. In an international study published last year by the Waste & Resources Action Programme, a British group, researchers compared more than 180 municipal waste management systems. Recycling proved better for the environment than burying or burning waste in 83 percent of the cases. It makes sense to reuse products, of course, and to reduce consumption altogether, as well as to improve initial product design. But given the rising mounds of waste worldwide, it also makes sense to recycle. 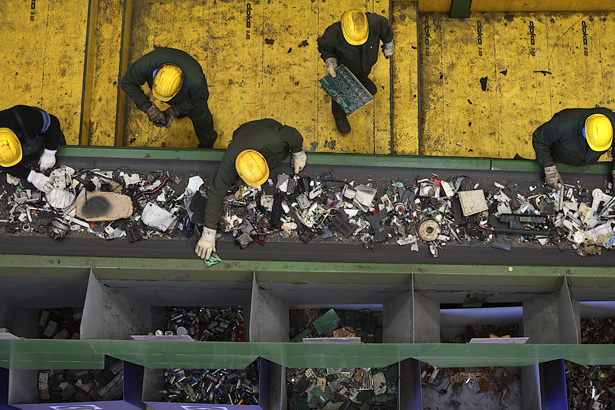 What Gets Recycled in the U.S. It depends on the markets. Whether or not a particular material is recycled depends on a number of factors, but the most fundamental question is this: Is there a market for it? Markets for some materials, like car batteries, are highly developed and efficient—not least because strict regulations govern their disposal—and a mature recycling infrastructure has grown up as a result. About 90 percent of all lead-acid batteries are recycled, according to the EPA. Steel recycling, too, has been around for decades, while formalized recycling of yard trimmings has not. Despite the explosive growth of plastics—particularly for use in beverage containers—that industry has been slow to develop recycling infrastructure, with most plastic still going to incinerators or landfills. Higher hygiene standards, smaller households, intense brand marketing, and the rise of ready-made meals have all contributed to an increase in packaging waste, but international trade may be the biggest factor. Even simple items like bottles of water now routinely crisscross the globe, meaning that thirst for a few swallows of “product” can generate not just plastic bottles, but also a large amount of other packaging debris—from wrapping film to bin liners to shipping crates. So far, Europe has led the world in recycling packaging materials—principally through the Packaging and Packaging Waste Directive of 1994. The EU directive calls for manufacturers, retailers, and others in the product chain to share the recycling burden. With the exception of hazardous wastes, the United States has been slower to embrace the concept of “extended producer responsibility,” as the idea is known, according to Bill Sheehan, director of the Product Policy Institute, a nonprofit research organization in Athens, Georgia. Some municipalities, however, are starting to demand that businesses help cover the costs of recycling.